It had to happen sooner or later. The old PC gave up the ghost and died on me. It was either the power supply or the processor that had finally met it’s end. I think the processor. Anyhow, it had served me well for ten years or so, being started and switched on and off daily in all that time. Something had to go in the end. I tried really hard to fix it but had to admit defeat and give the thing a decent burial. I will remove the hard disc before taking it to its final resting place at the recycling centre, which used to be called the rubbish dump before PC meant something other than Personal Computer. There is data on that hard disc that I need and will try to get rescued by some devious means or other. I know a few tricks myself, so nothing will go untried. My years of budgets for instance. All paid and preserved. E-mail addresses and other stuff too. Letters, postal addresses, records of transactions both electronic and personal. Phone numbers. All kinds of useful stuff. I can’t throw that all away, now can I? It must be rescued. And so to the new machine. Computers have changed. There is no floppy disc drive any more. That has gone. There are six USB ports. An all purpose CD disc thingy for DVD’s, music and pictures and with a built in burner. Four slots in the front for various cards, telephone attachments, PDA’s and the like. I’ll probably never use them but they are there. A whole collection, both front and back, for add-ons like loudspeakers and microphones. I may use some of them. Setting it up with all the wires and cables is a doddle these days, so that went well. I’m back on the internet, so that’s a good thing. I re-established my email accounts too. And for my dear lady. She has her own log in and own profile on this computer now. Which means she won’t clutter my workspace with her games and shortcuts. OK, I could have done that years ago, but this seemed like a good reason to finally do it. Then one has to install all the bits that hang off the machine, like the printer, the webcam, that sort of stuff. All this takes time. My old camera is redundant now. It took pictures with the aid of a floppy disc. It took great pictures. Now I will have to use the little digital camera to take pictures and put them on show. As I said, there is no floppy disc “A” thingy on my new machine. On the other hand, it is extremely fast. WOW! No waiting here. I am getting used to a new operating system too. XP is dead, long live Vista. Bill Gates seems to have this one sewn up. 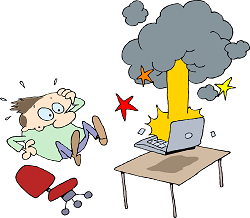 I will be importing things like Firefox and my email programme is Thunderbird. We don’t have to be totally dependant of Microsoft. Having learnt my lesson with the death of the old machine, I have decided to use a little USB memory stick to store my documents and useful information. 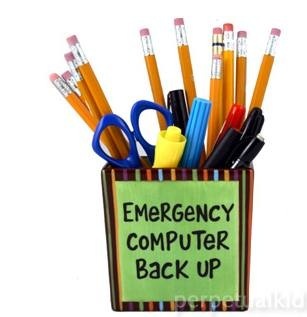 This kind of back up is essential. It works like a portable hard disc too. Handy for moving information from one place to another without the electronic connections. I’m sure most of you knew that but hey, I’m an old dog. Bear with me. I suppose the next thing to disappear will be the CD disc drive. Who needs to burn discs any more with these things available? Old dog or not, I can see the writing on the wall – woof, woof. Now then.. how do I shut this thing down? I took another turn in the woodpile today, despite the drizzling rain and the cold wind that blows incessantly across the piece of mossy grass that I call our garden. I worked hard at it today, mainly trying to keep warm whilst reducing the pile of tinder that will bring warmth and comfort to our living room in the coming months. After a while, I was hungry. Lunch. Trudging over the swamp that our lawn becomes in the winter, I was looking forward to some real sustenance. Meat and bread. Cheese maybe. And a beer to brighten my day. Kicking off my wet shoes and dumping my wet jacket, I headed for the fridge. I flung open the door with a certain sense of impending satisfaction but, to my horror, I was met by a wall of green stuff. Salads, broccoli, ruccola, avacados, a cucumber, pepper fruits, carrots, tomatoes. That sort of stuff. Coca cola, white wine, milk and bottles marked “Aqua D’or”. Potatoes wrapped in kitchen foil. Cold boiled fish, which is for the dogs, not me; jars of marmalade and jam. There is something seriously wrong here. Where’s the ham? Where’s the cheese? No beer? What is going on here? We then had a quick discussion about the contents of the fridge and the lack of male foodstuffs. My contention is, that there is no place in a fridge for green things. They don’t belong there. Men don’t want them anyway. Men eat meat. Not grass and the like. My wife’s position is, that the fridge is full of food. I disagree. A lettuce leaf is not going to appease my hunger. And then I had “the revelation”. See, I have always thought that there is something pathetic about a man drooling over a salad bar. He is not well. He is mentally incapacitated and not truly up to scratch on the male hormone stakes. Women eat salads. Men don’t. At least, not when they are just looking for that quick food hit in the middle of the day. I haven’t heard any of my mates say anything along the lines of “I could go for a quick salad…” Neither would I. We say things like, “I could kill a burger…” or, “A steak sandwich would hit the spot..” Salads? Not for real men! Sorry ladies, it’s the truth. Accept it. Ruccola is Italian for dandelion. And it isn’t in our vocabulary nor is it on our “must have” food list. You buy it – you eat it. We men don’t. The solution to this, is obvious. We need separate fridges. Like we have separate toilets in restaurants and bars. My fridge would be full of the stuff of men’s food needs. Cold meat. Cheese. Butter. Eggs, sausages, bacon. Anything that can be fried in a pan. And beer. You know, real food. Her fridge would be filled with all that green stuff that the female apparently has a greater need for than cattle or rabbits do. Fruit and such. Ruccola. Those unbearable tasteless ava-bloody-cados that have always seemed pointless to me and yet attract the females like moths to a flame. Root vegetables and the like thereof. There would probably not be any beer, but who cares? I wouldn’t go into her fridge anyway. So there we have it. The difference of the sexes exposed at last. I realise that not everyone has the room for two fridges in their homes. I also realise the expense involved in running two of these machines. So here’s a thought for the ladies, as you seem to be the ones that do the buying for the family: Print this following paragraph and keep it with you. Keep a shelf clear in the fridge for the man of the house. Fill it with meat products and cheese. Keep it simple. It has to be instantly available food, ready cooked and not something one has to prepare with a knife or a grater or any other kitchen equipment. It should be grab and eat. No salad. Man is a hunter, not a peel, slice, dice and mixer. Slicing cold meat is all he is capable of at times such as these. He’s hungry now and that’s all he knows and he doesn’t have the time to wash, peel, chop or dice and prepare. He is in a primal state, like a bull on heat, so don’t confuse him with complicated things like kitchen tools. Do him a big favour. Put a beer or two in there as well, preferably in tins. No time for bottle openers. He’ll love you for it. He may even reward you with flowers. But you don’t have to eat them even though they are vegetable by definition. Fill the rest of the fridge with all the green stuff you want. Don’t worry. He isn’t going to eat it. And if you ever hear him ask, “Have we got any ruccola?” around lunch time, then either send him to the doctor or get a divorce, because something is seriously wrong with him! How Much Wood Could a Woodchuck Chop…? Short answer; I don’t have a clue. But I know how much I have to and as I usually end up ruining myself for a week every year by sawing and chopping my way through all the pallets that carried my winter firewood, I could use a woodchuck or two myself. No matter how much, or little, they could chop for me. The whole process of reducing this packing to kindling usually leaves me sweating, panting and worn out. Not to mention the thousands of splinters that always get stuck in my hands. This year I decided to get mechanical. You know – power tools! My manual labour days are over! I have an electric chain saw, but that is a bit too vicious and unwieldy for firewood. I needed a hand held circular saw. Off then, to the builders suppliers. One expects to have to pay a bit for a good saw, so buying a power saw of any kind was going to be expensive. So I thought. But not so. My local builders merchants have a selection of small hand held circular saws up for offer. I went off bargain hunting. I found one too. Prices vary, they say, but this was a good buy. Having looked at all the big names, I finally found a saw for less than half what I would pay for the deluxe Black and Decker. I don’t need the deluxe model anyway. After all, I’m going to cut firewood, not build a mahogany table or anything like that. I’m no carpenter. A word of advice for all would be buyers; always inspect the contents of the box before leaving the shop. There’s nothing worse than getting home and finding you miss something vital. Having satisfied myself that all was in order, I hurried home to get started. After listening to all the usual warnings from the long haired one about keeping my fingers and such out of the way of the blade, I got set up in the garden. Being a bit short of time today, I decided to limit myself to one pallet now and the rest later in the week. Arming myself with a jemmy, an axe and my trusty new saw, I got stuck in to it. Easing the thin planks away from the pallet superstructure was easy and then I prepared a makeshift bench of the pallets themselves. Hooking up my new saw I gingerly made the first cut. WOW! See those splinters and sawdust fly! This is living, folks. Easy peasy! 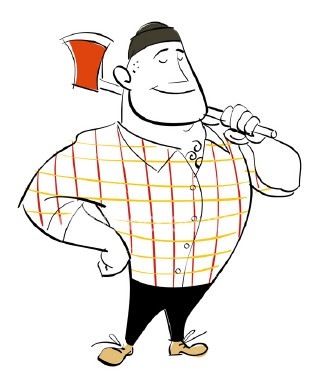 I’m a lumberjack and I’m alright…. Well, not really, but you get the picture. My dear lady wife looked on in awe, or was it disbelief (?) and hovered worriedly around the first aid box. Very soon, I had a heap of firewood and enough kindling for the entire winter. I used my wheel barrow to cart it off to the woodshed. Even the dogs joined in, barking ecstatically every time I started the saw and running round my feet while trying to catch the sawdust. What normally takes me a couple of hours of blood, sweat and cursing was done in next to no time. And I still have all my fingers. I couldn’t help thinking, I should have done this years ago….! !